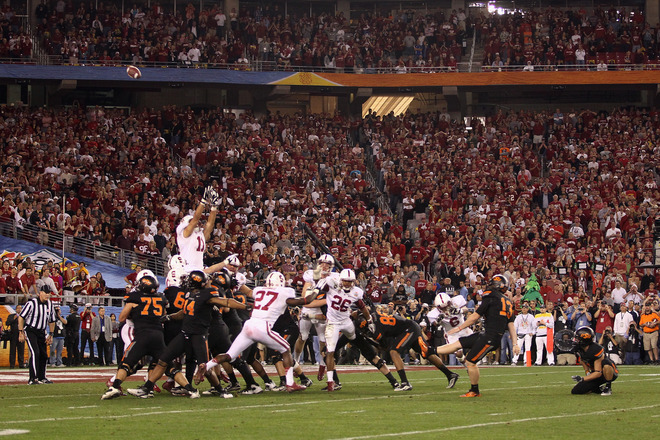 So far, 2012 has been the year of the kicker. The day before in the University of Phoenix stadium, Jay Feely of the Arizona Cardinals nailed a game winner in OT. A day later, RS freshmen Jordan Williamson botched key FGs for the Stanford Cardinal as they lost in OT to the Oklahoma State Cowboys, 41-38. Stanford started off well as they leapt out to a 14-0 lead. Brandon Weeden started off slowly by throwing an INT on his first attempt, but OSU tied in the game after two big touchdown plays by Justin Blackmon. With 3:12 to go in the game, Joseph Randle tied the game once again for the Cowboys in a back and forth game, meaning 3:12 for Andrew Luck to work with. Luck would set up a 35 yarder for Williamson, which the freshmen pushed wide-left. 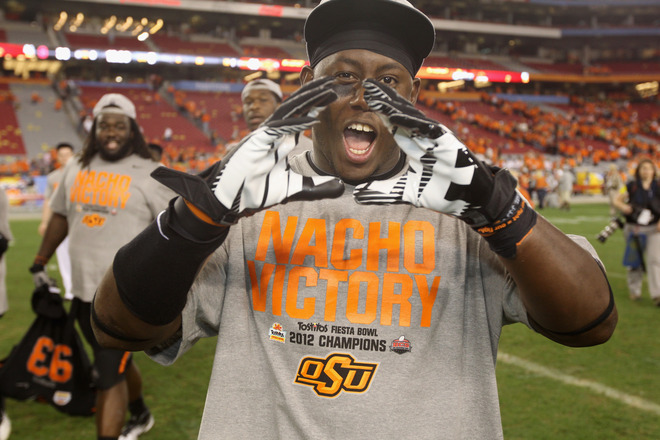 The kicker would miss the FG again in OT, and OSU would capitalize with a Quinn Sharp chip-shot. The true irony of this game is that both kickers missed key FGs that would've changed their seasons: Williamson missed the Fiesta Bowl game winner and Quinn Sharp missed a would-be game winner against ISu, their only loss of the season. It seems kicking affects football in all the wrong ways. This is how Andrew Luck's stellar college career will end. Breaking John Elway's records doesn't get you Rose Bowl berths as Stanford has finished second in the Pac 12 to the Ducks. Luck finished as runner-up for the Heisman twice. All he can hope for is being drafted 1st.